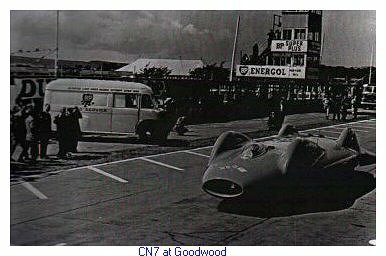 Donald Campbell used two different cars in his Land Speed record attempts, both called CN7, these were originally to be called "Campbell Norris 7" but through a slip by Donald on the first press release it became abreviated. The First was destroyed in a crash at Utah in 1960.The second was similar to the first but it had a tailfin to help stabilise the car.The body had an internal framework of honeycomb type aluminium alloy structural panels.It was powered by a Bristol Siddeley Proteus 705 gas turbine engine. All four wheels were driven and benefited from fully independent self-levelling suspension. They were able to turn only 4 degrees of lock each way. Suspension and damping was provided by Girling oleo-pneumatic (nitrogen) struts. 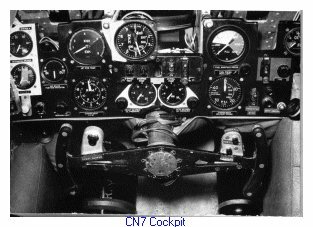 Special equipment included a hydraulic, built-in jacking system, instrument telemetry and electric fans to cool disc brake assemblies. At the time of record attempts there was also self-contained breathing apparatus in the cockpit and a camera pod mounted on the tail.The first World Land Speed Record attempt test runs took place at Bonneville Salt Flats, Utah, USA, on the 5th September 1960. Donald drove the car on two trial runs, going through the measured mile at 124mph on the first and 172mph on the second. Unexpectedly, Bluebird's recording and communication equipment was rendered inoperable in the vast static electricity receptacle of the salt flats.During the first run on 16th September 1960, Campbell drove Bluebird at a speed of 300mph. Pleased with this performance, he decided to make an acceleration test on the next run. During this second run, there was a terrible crash. 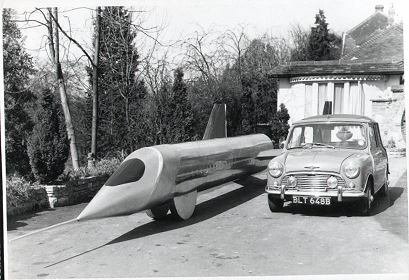 Bluebird was travelling at an estimated speed of 365 mph, attained within 1.7 miles, this was the greatest acceleration ever achieved by a four-wheeled vehicle. Unfortunately,the car drifted to the right and the left hand wheels crossed over the central marker line, which was laid with oil. This caused the the wheels to spin, this caused the car to slew which created massive precessional torque causing the car to roll and become, in effect a huge aerofoil. It flipped and spun and touched down four times before stopping. Campbell suffered a fractured skull, together with minor injuries. Bluebird's engine, cockpit, some crossmembers and some other components were unharmed, though the body and suspension were beyond repair. 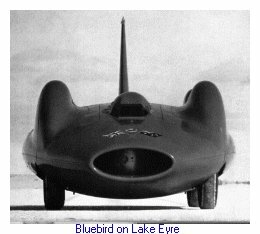 Bluebird was then rebuilt shipped to Australia for futher record attempts. Test runs were made at Lake Eyre, South Australia, in May 1963 and June/July 1964. The site was 35 miles from Muloorina and 30 miles from the nearest town called Maree, the South Australian government had graded a track from Muloorina to the shore of Madigan gulf on Lake Eyre. a 2nd track was constructed parallel to the first one, due to rain and also it was constructed similar to the track that they had used in Utah, which greatly reduced the salt islands. . After lengthy set-backs due to unseasonably wet weather, Campbell piloted Bluebird to a new World Land Speed Record of 403.10mph on 17th July 1964. His speed in each direction was identical, despite the many variables in surface and wind strength.